Poverty: It’s something we don’t think about very often unless we’re going through it. In that case, you think about it all the time. If you’re struggling with poverty, it tends to seep through your everyday thoughts. It’s hard not to think about it when you have to make decisions about feeding yourself and your family, or paying for shelter. It’s hard not to think about it when your teeth are hurting and you can’t go to the dentist, or you can’t afford medications, or you have to make the choice between which winter hat you’re going to wear to bed, because heating is so expensive. However, there is another time we think about it – Christmas. During the holidays we think about it quite a lot, more than the rest of the year. There is something inherent about the holiday season that makes us reflect on those who struggle. For some it’s religion, for others it’s the sentimentality of the season. We’ve been hard wired to think about Tiny Tim and the rest of the Cratchits at sometime during the holidays. Christmas is a time of giving, and I think as a by-product of that tradition, the holidays also highlight those who have little to give or receive. That sentimentality isn’t a negative. I think because of it people are very generous during the Christmas season. I know this from personal experience. When I was a kid I learned this firsthand. During some rough years, a Christmas Basket came to our door. As an adult, I’ve been able to deliver some of these baskets myself, and have seen the familiar look I once had when receiving our own basket – part shame, part hope, part struggle, and part thankfulness. The last few years as a volunteer for the Salvation Army’s Red Kettle Campaign in Brantford and Paris, I’ve been able to see firsthand how generous people can be. It’s a rewarding experience. For those who are unfamiliar, the Red Kettle Campaign has been going on for over 120 years. It started in San Francisco when a Salvation Army Captain named Joseph McFee wanted to fund a dinner for 1000 of the poverty-stricken folks in his community. He didn’t know how he was going to fund a project like this. Then he remembered as a boy in England there was a huge, iron kettle called a ‘Simpson’s Pot’ where people would toss coins in to help the poor. The next day, he put a pot near a Ferry landing in San Francisco and made a homemade sign that said “Keep the Pot Boiling.” Soon enough, he had the money he needed to make sure people were properly fed that Christmas. The idea grew and soon Boston, New York and other cities, started their own campaigns using the kettles. Millions of people have been fed in the years since. 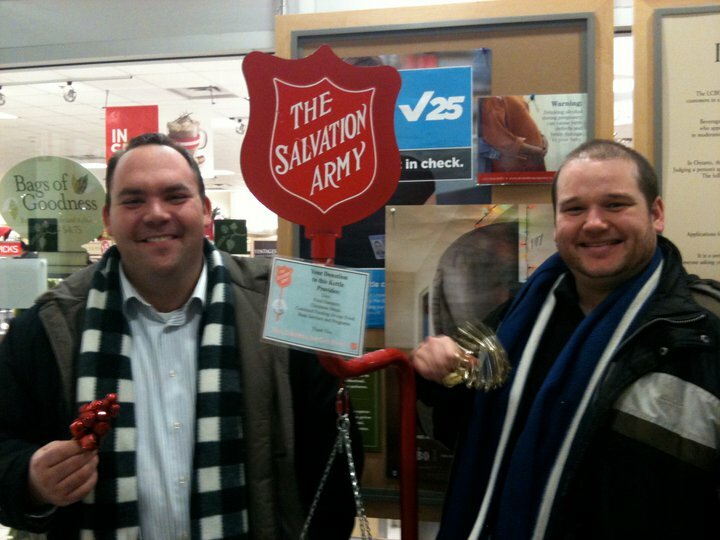 Now the kettles help communities, like ours in Brantford and Brant County, create Christmas hampers, stock food banks and help a variety of people, from parents who struggle to feed their families on part-time and minimum wage work, to seniors who have seen the cost of living rise while their ability to pay has not. When you volunteer for a Red Kettle you’ll often hear from folks who have been helped directly. Its very rewarding, and if you bring a friend its also very fun. Last year I took a shift with my friend Brian two days before Christmas at the Lynden Park Mall. As you can imagine people at the mall two days before Christmas are not casually shopping. For those at the mall that day, it is less a shopping excursion and more of a panic parade. BUT, people were still generous; really generous in thinking about others. We were amazed by how many people made sure to swing by and drop off what they could to help someone they’ve never met, despite the Christmas countdown that was likely going through their heads. One of the most rewarding aspects of being a Red Kettle volunteer is watching parents teach their kids about generosity. In a very commercial world, there is something incredibly uplifting about watching streams of kids, whose eyes light up as they amble up to the kettle and give something away. In that moment you see that they get it, and you see how important it is to their parents that they do. It’s heartwarming and hopeful. There are other fun moments too. Getting a letter from my Dad telling me that he’s proud I volunteer for the Kettle program because it’s his favorite charity. Seeing people you know walk by and having them consider joining you the next year. Little kids asking questions about what you are doing and then coming back an hour later with something to give after talking to their families, or raiding their piggy banks. My favourite memory might be the time a lady offered me and my friends, Neil and Matt, a 5 dollar donation if we’d sing her a specific Christmas Carol. Then seeing her face when we started to sing, and having her offer another 15 dollar donation if we’d stop. I think she just really wanted to give us 20 dollars, at least I hope that was it. When you walk by a Red Kettle this year think about volunteering for a shift, or donating what you can. Last year across the country, donations were down 10-12%. Its a tough economy, and that’s why it’s all the more important to help out if you’re able. Buddy, can you spare a dime? A few hours? A dollar?